This is my first year living on my own, and cooking for myself– that means a lot of ramen! Also, the weather is getting colder, so the only thing I really want is a titanic-sized bowl of soupy deliciousness. For me ramen is the college super-food; sustaining students, rich and poor, for generations. With this in mind, I decided to turn the volume up and eat some that isn’t ready in three minutes or less. Abutting campus is Allston, home to countless multiethnic restaurants, and luckily for us many places to get some great ramen. Two of my favorite places to visit are Totto Ramen, a New York original that has finally made its way up north, and Inaka, a more traditional approach to the famed soup. Inaka serves up traditional Japanese fare like donburi, or rice plates, and of course, ramen. My visit was pleasant and hearty; the restaurant has a traditional Japanese design with an intimacy and warmth that is great for cozying up to a steaming bowl of ramen. With prompt and kind service, this is a welcoming space to go to unwind. I ordered a titanic-sized bowl of miso ramen ($12.95) that was placed in front of me and was accompanied by a large wooden ladle for me to gratefully slurp down the broth. The ramen was a simple and earthy miso-pork broth that was full bodied, salty, and had a unique miso flavor. The miso lent a perfume of fermentation, in a good way, to the stock, which also carried a briny saltiness of kombu (seaweed) that I found to be a little off-putting in this soup. You are given the choice of thick, thin, or medium noodles and I opted for the medium, which are long and tender, yet slightly chewy. On top of the heaping bowl of noodles was corn that gave a touch of sweetness and balance to the soup, a generous portion of fatty pork, bamboo shoots, half of a soft-boiled egg, a piece of nori, a sprinkling of fresh scallion, and a pink pinwheel of fish cake called narutomaki. Overall I thought that the ramen was excellent and I greedily slurped the whole bowl in a matter of minutes. 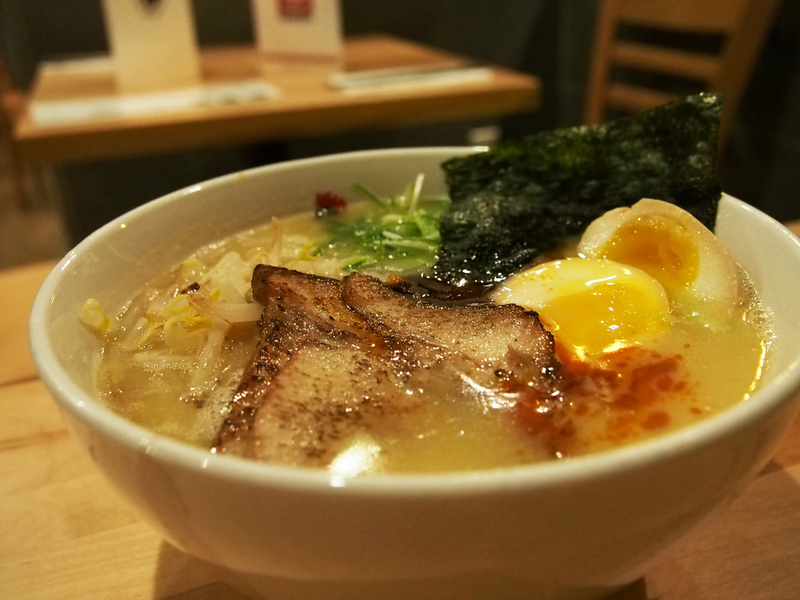 If you venture further up Brighton Ave. just a few steps past Harvard Ave. you’ll find Totto Ramen, which serves up a more modern take on the classic soup. The atmosphere of Totto is contemporary and feels almost like the interior of a chipotle, but with bamboo instead of corrugated steel. The space is dominated by a massive bar, behind which the cooks prepare your soup as you wait anxiously by. The service is quick and polite and the space is dominated by the enticing sounds and sizzles from the open kitchen. I ordered their pork-based spicy ramen ($11.25), with the additional topping of a boiled egg ($1), and a side order of the broiled char siu pork ($6). The pork was nothing remarkable and was the same pork they put on top of the soup. By itself, the pork was under-seasoned, dry, and tasted of nothing more than the coals it was broiled on. The soup, on the other hand, was delicious! The broth is soy sauce based and served with spicy chili oil that adds a kick to help warm you up on a cold day! The broth is deliciously balanced with a chicken and soy base that blends perfectly together for an earthy and rounded soup. However, the chili oil is deceptive. It is served as a squirt in the middle of the ramen that, once mixed in, can quickly overwhelm the unprepared eater with its spice. The soup is also thickened by, what I believe to be, potato so that more flavour adheres to each noodle slurped. Also served with your groaning bowl of noodles are more of the char siu pork (which benefits greatly from the coating of broth), a piece of nori, fresh bean sprouts that are a thoughtful addition to help to cut the spice and salt of the soup, fresh scallions, and I recommend the addition of the soft boiled seasoned egg that rounds out the flavour profile of the soup. Out of the two restaurants I tried I preferred the rich and thoughtfully composed bowl of ramen from Totto ramen. The execution of the dish seemed to be more attentively created. 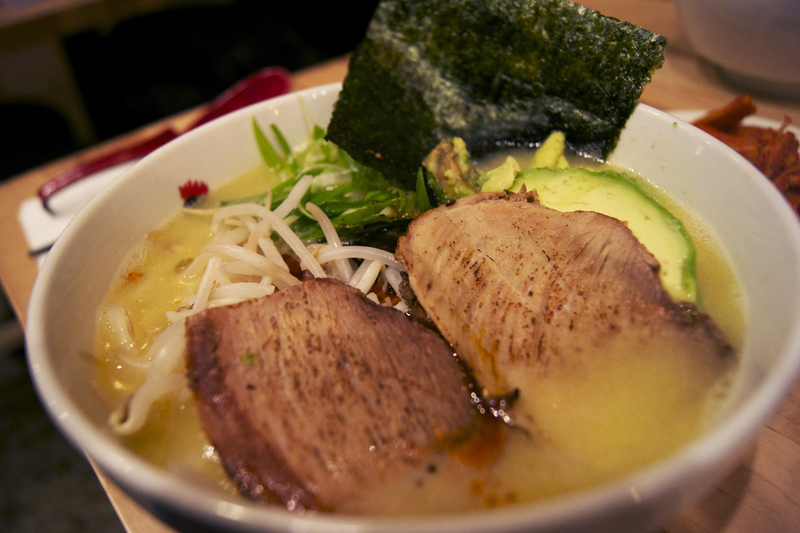 The ramen was not boring or repetitive and was designed for maximum flavor with every bite. Inaka’s ramen, while delicious and full-bodied, is not as refined as the Ramen at Totto and came off a little flat in comparison. While I’ve only sampled a few of the ramen restaurants that Allston has to offer I look forward to trying many more in the near future to keep myself warm in the coming months! Mon-Sat 12-4pm, 5:30-11pm; Sun 4pm-11pm.